What is a Cured in Place Pipe? Cured-in-place pipe (CIPP) pipe lining is one of several methods used to repair existing pipelines that don’t require that you dig up the pipes. CIPP is a jointless, seamless, pipe-within-a-pipe with the capability to repair pipes ranging in diameter from 4–110 inches. Lining the pipes is less expensive and more efficient than traditional open cut replacement methods, normally installed with little or no digging. The CIPP process involves installing a resin-saturated felt tube that later hardens into a strong "pipe-within-a-pipe." The use of CIPP for water and sewer line repair and replacement is widespread across the US. There is a possibility of residual chemical release during the process. Most of the studies to date have focused on the environmental impacts of styrene, a major ingredient in the curing process. However, vapors and their effects on indoor air quality are important considerations for utility workers and residents. Many residents notice a smell like that of new plastic during the pipe repair process. This odor may be caused by ingredient used to make the CIPPs or compounds created during the in-situ manufacturing process. One chemical that has received scrutiny is styrene, but other chemicals are also emitted. Join NEHA, Purdue University and the CDC National Institute for Occupational Safety and Health (NIOSH) for an informative webinar about the hazards involved for workers and residents associated with cured in place pipe repair. The webinar takes place on October 5, 2017 from 3 to 4 Eastern time. This webinar is designed to help local, state, and county health professionals better understand public health and occupational exposures with the cured-in-place-pipe (CIPP). Results of a July 2017 Purdue University CIPP safety study (http://CIPPSafety.org) will be presented as well as lessons learned from a NIOSH workplace Health Hazard Evaluation, and options for health officials, agencies, companies, and workers to gain technical assistance (https://www.cdc.gov/niosh/hhe/). The CIPP installation procedure is being used to repair about 50% of the water pipes in the U.S. While primarily used for buried sanitary sewer and storm sewer pipe repairs, it is also increasingly being used for drinking water pipes and building plumbing. 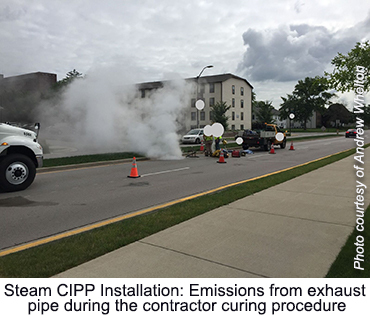 Because raw chemicals are used and the plastic pipe is manufactured in the field, the CIPP installation process releases chemicals within the pipes being repaired as well as into the surrounding air. 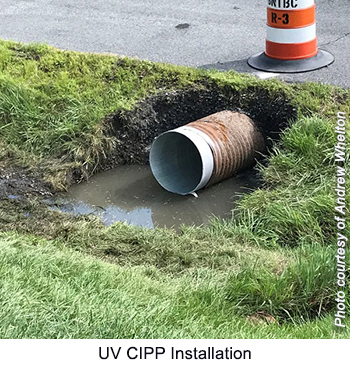 Health officials have responded to building contamination incidents because CIPP chemicals have traveled through sewer pipes and air intake systems into nearby buildings. Some incidents prompted the evacuation of homes, office buildings, day care centers and schools, and required some persons to seek medical care. Health officials will benefit from better understanding the installation processes and materials emitted.